Give me land, lots of land, under starry skies above … don’t fence me in. Is this not the anthem of every dog? For most of our four-legged friends the suburban backyard is sadly lacking, with barely sufficient room for a meander let alone a solid run, and everyday, the same old scents to sniff. Now, the dog parks offer more space and some relief from those oppressive leads but those wretched fences still stifle the opportunity for unrestricted freedom. Enter Green Hill Reservoir Park, a Brisbane City Council Dog Off-Leash space, located off Russell Tce, Chapel Hill. I arrived at the park expecting a dog park; that is, a sizeable, fenced-off space, with dog appropriate amenities, some shelter and a few trees. What I found was a rather large building (the reservoir), a couple of boom gates, some signage, poo bag dispensers, bins, taps, trees and a bitumen ring road. Needless to say I was very confused. Fortunately, a regular park user pulled up not long after me and kindly explained the concept. Apparently from boom gate, round the reservoir via the ring road, to the other boom gate is the off-leash area, so once you pass through those gates you can release the hound/s and off they go, free to explore, run, roam, do whatever they please. Between Russell Tce and the Reservoir Ring Road is bushland. Not acres but several metres, which provides a barrier between the traffic and the dogs. However, I wouldn’t bring an untrained dog to this area as they could easily run off and get themselves and the passing traffic into trouble. 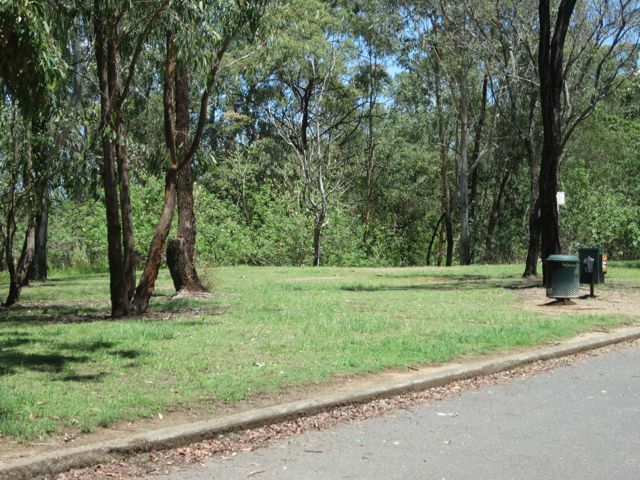 Apparently, the park is 6,249m2, however sharing the space is the reservoir, some other small buildings and, of course, the bushland so the opportunities to throw the ball with gusto are limited, especially as much of the space is long and narrow. Having said this a few small throws are certainly possible along the road and within a few larger sized pockets of grass. From a human point of view the park is very tranquil (or at least it was when I visited) and spectacularly beautiful with one section offering breathtaking views across to the City. My human guide also commented that she enjoyed the opportunity to exercise with the dog rather than just standing around as she often found herself doing at the more traditional dog parks. The trees and reservoir provide plentiful shade and the amenities are sufficient for a stress-free experience. Take note, however, as the bushland is the ideal environment for ticks and snakes so it is imperative you know where your dog is at all times and examine them after a visit. Apparently this park is very popular, especially with families who can bring the scooters and bikes for the kids to play on, whilst the dogs’ roam free, thus everyone is happy, bonding and exercising in a relaxed and informal manner and nobody is nastily fenced in. Porter, C. 1934. Don’t Fence Me In. (Recorded by Bing Crosby). On Miscellaneous. Label: WB Music Corp.